(c) Nancy Vada Gibb. Please do not copy all or part without permission of the author. (Many more photos to be added later, when I can access them. Some sides were not in good condition, and some photos are from scanned negatives). 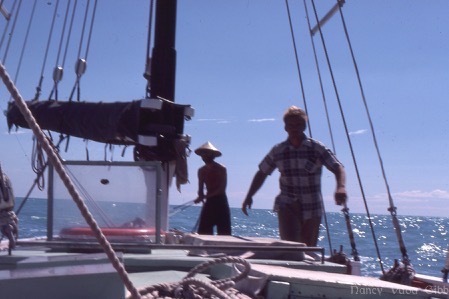 Cornelius was a typical Broome lugger – in nautical terms a bald headed gaff rigged ketch – built in 1953 by Malay craftsmen employed by Male & Co. In Broome, Western Australia. Like all other luggers she was very sturdily constructed with a hull of inches-thick jarrah on spotted gum ribs, designed to withstand the extreme tropical weather conditions and enormous 10 metre tides of the northern Australian coastline. Of 33 tons nett, with a ballast of heavy Kimberley iron ore, she had a shallow draft of 2 metres (six feet), was 17-18 metres (about 56 feet) overall, and carried 2300 square feet of very heavy once-white canvas sail, roped and handstitched and almost impossible to handle. The sheets were inch thick manilla or sisal rope and there were no winches or cleats, just solid belaying pins. The buffers under the main and mizzen booms were made from old diving hose, and the enormous tiller was controlled by a rope bridle. There was no shelter for the helmsman from heavy weather although luggers built in following years had a small wheelhouse. Photo: Nicole ‘steering’, showing the unique rope-and-block arrangement attached to the heavy tiller and used by early luggers. Those following ‘Cornelius’ had wheels. We purchased Cornelius in 1973. At that time there were still about 10 luggers left in Broome, most of them painted the distinctive dark green and white Streeter & Male colours, which Cornelius retained to the end of her days. 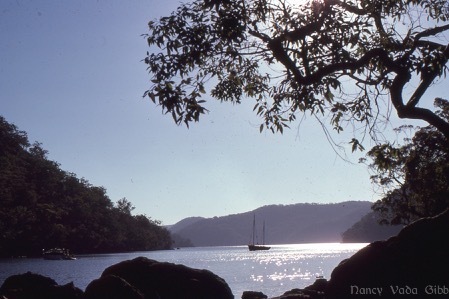 Named after one of the earlier Males, Cornelius was used as a ‘reserve’ pearling boat rather than being in full-time commission, so spent some of her time sitting in the mud and mangroves of Damper Creek, doubtless visited from time to time by the countless ghosts of old-time swashbuckling Broome. She experienced her share of cyclones and pearl diving incidents, also a partial sinking, and at the time we bought her was fully equipped and proudly wearing her fleet number B11- a number which was changed every year because of superstitions. This number was also on a lovely old wooden box in which we stored our safety flares and sailmaking tools including sailmaker’s palms, heavy needles, waxed thread and various sized fids – we could never bring ourselves to repaint that box. We were told that every year each numbered box would go with the fleet number to another boat. Photo: Dampier Creek from Streeters Jetty, 1973. Some pearling luggers were still in operation at that time. My first glimpse of the boat for which we had forsaken city life and our beloved sports cars was not reassuring. She was sitting in the mud alongside Streeter’s jetty, draped with canvas ‘skirts’ to protect her paintwork from the fierce sun, with her decks festooned with old ropes and covered with canvas sacks. Below deck there was a separate aft bosun’s locker in which pearl shell was customarily stored, and for’ard were 3 compartments each with its own hatch, separated by plywood partitions. Our unlikely “bridal suite” (formerly the Captain’s cabin) contained 3 bare single bunks; the engine rooms with an additional 2 bunks was dominated by a huge 46 BHP Lister engine which took 4 people to start; and the for’ard cabin was customarily used by the crew for cooking, eating and sleeping and contained another 3 or so bunks. It was all very bare and smelling strongly of cordage, tar and the sea; and was plentifully inhabited by giant cockroaches which nibbled our toenails in the days to come, and a few rats which we could see taking moonlight strolls. The last one jumped ship some months later in northern Queensland. With some adventurous friends as crew and the willing assistance of various Male & Co. employees under Ahmet the foreman, in a week or so we had her shipshape, loaded all our stores transported from Sydney in a shipping container, and after a farewell lunch on board with Kim Male we sailed out of Roebuck Bay and into our first experience of heavy weather. We were all glad to sail into Beagle Bay 24 hours later to lick our wounds and apply the first of many, many patches to the heavy old slippery sails. We continued ‘round the top’ of Australia via Thursday Island, with many stops at wild uninhabited beaches and islands, and a brief careening in Darwin to apply a little more caulking to some leaking seams. Then down the east coast to beautiful Pittwater north of Sydney, just in time for Christmas 1973. Photo: Preparing fresh oysters at Pittwater for early visitors Auntie Bet and friends Jay and Roger. This photo shows the old deck, which leaked badly despite e very seam being “sealed”with white paint. We spent some months there before sailing further south to Sydney where we moved to a yacht club marina in Rushcutters Bay. Eventually Geoff reluctantly donned his city gent’s suit and like me returned to work. During the next few years Cornelius was a familiar sight on Sydney harbour at weekends, usually laden with friends, and proudly flying the Island Sailing Club of Cowes burgee and the Red ensign – Geoff was a dyed-in-the-wool Englishman. Gradually Cornelius became transformed. All the cordage had been replaced early and the navigation lights electrified, but now all the interior joinery, bunks, cabin soles, tanks, etc were removed; the winch drum and anchor chain were galvanised, and the bilges and iron ore ballast were degreased and cleaned. The bosun’s locker was cleared of its huge accumulation of pearl shell chips and mud, and became a proper chandlery. Most of the oakum in the hull and deck seams was replaced and the seams sealed with hot pitch (those wonderful smells took me straight back to my childhood days in my Granddad’s boatshed in Sydney’s Tambourine Bay). The topsides received several coats of fresh green and white paint, and two old brass portholes were inserted on each side – not strictly traditional, but desirable for ventilation. Below decks was transformed into a comfortable if small dining saloon dominated by a splendid highly varnished and gimballed (swinging) table and above it a rack of signal flags, a galley with dual kerosene Primus stoves (a camp oven made great bread and pies) and a freezer, but as yet no sink (I finally got one years later), a proper bridal suite (? ), and guest accommodation. We even manage to squeeze in a marine toilet behind a curtain, it had been a wedding present from my redoubtable Aunt Betty. My beloved cat Minou who lived to be 19 and proved to be a world champion swimmer, was introduced to shipboard life. At first she was very confused as previously safety lay ‘up’ and now it was ‘down’; but after a few months living in her own little cat house and hammock on deck she adapted. She enjoyed guarding the boat when we were out and conversing with people rowing past, particularly at night. But she hated sailing and had to be given a warm bath every time we arrived in port, to wash away all the seasickness. Eventually Cornelius moved to a permanent mooring in Fivedock Bay and us to a gorgeous little flat ‘just around the corner’ in the Parramatta River, with a wonderful landlord Basil with whom Geoff talked boats endlessly, and an equally wonderful landlady Nina with whom I shared many a G&T and game of scrabble. Fivedock Bay was memorable for two things. Early one morning during a strong gale Cornelius dragged her mooring slowly across the bay and was rescued just before she reached the rocks; and on another occasion a friend who had been persuaded to scrub her bottom under the guise of trying out our new compressor and scuba gear, discovered that the Bay was the breeding ground for millions of baby shrimp which became tangled into every conceivable type of body hair. A new taller mainmast was constructed on board from 16 pieces of hardwood, and the original main mast (a single piece of iron-hard wood) erected in place of the mizzen, which was given away. New booms and gaffs were also constructed, and a new and longer bowsprit; new blocks and strops (all handmade), and new solid rod and wire rigging were made and installed, all strictly in keeping with traditional Broome lugger style.Unfortunately the taller mainmast meant that spreaders were essential, and that meant runners, which we hated. (The early engineless luggers had taller masts, essential for manoeuvrability, but once they started carrying engines, the sails were only used for drifting over the pearlbeds. We wanted to SAIL and that meant being able to go about without resort to the engine.) New tan terylene sails replaced the old worn out canvas ones. The material was ordered from England, cut out on the floor of a disused factory at night, and stitched over innumerable evenings first with an old sailmaking sewing machine (a ‘find’) and then finished off with roping by hand. Incidentally Cornelius was the first and last lugger to wear tan sails. The reliable old Lister engine received a new lease on life, with teeth inserted all around the flywheel which meant one person could start it with a smaller engine, despite all the critics who claimed it was impossible. Prior to that it took at least 3 and usually 4 persons to start – except during a moment of utter desperation in Darwin when the anchor was dragging us to within feet of rocks, the adrenalin was pumping, the crew nowhere to be seen, and Geoff and I achieved the seemingly impossible. This new starting arrangement also meant we could take the boat out with just the two of us, Geoff steering and me standing in the engine room hatchway ready to scramble below and adjust the throttle or gear lever on command. We never got around to installing deck controls. Manoeuvring into small berths at marinas was tricky and provided me with lots of exercise. 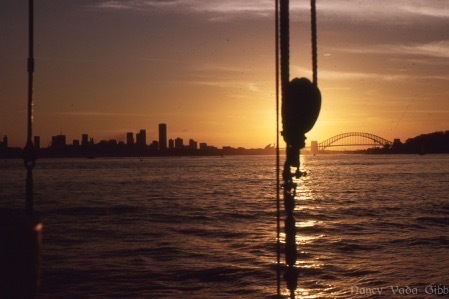 In 1977 we said farewell to all our Sydney friends and took off for a new life in Bowen in northern Queensland via Lord Howe Island and Middleton Reef. It was during that trip that I became seasick for the first time in my life, a peculiar condition which did not ease when I had been ashore for some time. Eventually the penny dropped that I was pregnant. Cornelius became home to a healthy squalling baby girl, soon covered with a heat rash, just days before the particularly wet and humid tropical Christmas of 1977. Eventually we decided that the old leaky deck simply had to go, and willing friends assisted in laying a beautiful new deck of beech, again strictly along traditional lines with V-seams filled with oakum and then sealed with poured pitch. Nicole on her 4th birthday. We never seriously raced Cornelius, but did take part in the second and subsequent Great Whitsunday Fun Races. Our initial win was described in the February 1979 issue of ‘Modern Boating’: “.. .The beautiful green-painted Cornelius from Bowen showed them all a clean pair of heels.” It was a most exhilarating race, I remember it very well! We also served occasionally as starter boat for various Bowen yacht races. Cyclone Kerry almost visited Bowen 2 years later. We stripped Cornelius to bare poles and she sat out the weather majestically, heeled over at about 40 degrees in the boat harbour, with anchors out fore and aft and additional lines to the mangroves ashore as well as to her customary mooring piles. I was grateful to the fisherman who offered to take the baby and me to his home, but decided to brave it out alongside my husband, who would not hear of leaving the boat. We owned the Bowen Slipway and after Kerry had passed, discovered the new metal cradle was seized solid with sand grains blasted into all crevices. Geoff eventually freed it all up by using a blowtorch to melt the sand. In early 1980 Cornelius said goodbye to Bowen for 13 months and we set off on our long-planned circumnavigation of Australia, with a varying number of paying crew for each stage. Cornelius came through it all magnificently. I always felt safe and secure with that solid hull, billowing sails and reassuring thumping engine, not to mention the skillful skipper. Certainly there were hairy moments – as when we got stuck on a rock in a fast flowing narrow passage near the Prince Regent River in WA. It was necessary to keep the engine going and ‘steer’ for several hours until the tide rose high enough to float us off. Above: About 20 km up the Prince Regent R. Below: King George River in the NT. Nicole fell overboard in a shark and crocodile infested river when we were at anchor and would have been swept away if Sylvie had not dived in immediately and grabbed her and then the dinghy as they were swept past astern. I was below happily making bread and ignorant of the drama until two dripping white faced forms came down the companionway ladder. The kindness of people we met all around Australia was incredible. “Like to come to our place for a hot shower – oh and bring the washing” was typical. Nicole made lots of friends. 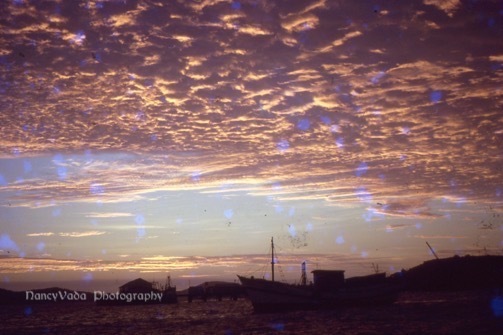 Photo above: A cultured pearl farm in Western Australia. People marvelled that our navigation gear consisted of an old brass sextant and leadline, plus compasses and Walker log, and Geoff’s ham radio. Also innumerable charts and pilot books, of course. 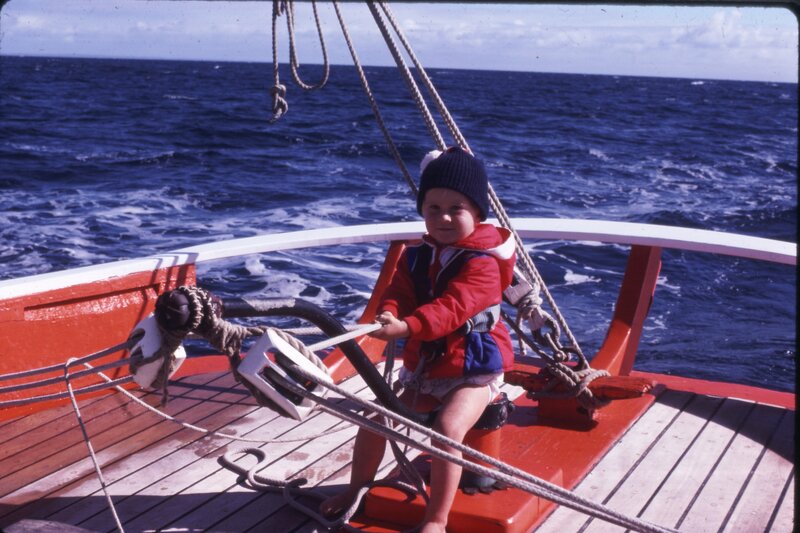 Geoff was a very careful and thorough navigator and planned the voyage carefully to take into account all the seasonal vagaries of the weather, favourable currents, etc. The only time we encountered unexpected weather was when we were in the southern ocean lurching along towards Tasmania, expecting to find strong southerlies and instead encountering a nor-easterly! On our return to Bowen Geoff decided to give the engine a complete overhaul. He took it completely to pieces – and it was still only half assembled when he died from melanoma early in 1983. Nicole and I continued to live on board for some time but eventually moved ashore, the ‘ghosts’ were too prevalent. Wonderful friends reassembled the engine and reinstalled it. Pete and Dee ran the Slipway competently until it was sold, and kept me sane. Eventually Cornelius was also sold and became a tourist pleasure boat around the Whitsundays and Southport. Of necessity her appearance was altered somewhat – the semicircular stern seat and massive safety rails were certainly not traditional to luggers. I used to visit her sometimes at Southport but could never bring myself to step on board until my friend Carole took matters in hand, spurred on by the news that Cornelius was for sale again. I was frogmarched on board to meet the young caretaker who must have thought my behaviour most peculiar at first as I wandered around exclaiming and stroking the bulkheads lovingly. Before he knew who I was he told us a story about a ghost called Captain Jeff who had loved the boat, who walked the decks at night (he had heard footsteps repeatedly), turned off any lights left on (as my Geoff indubitably did, and the caretaker swore had happened with him), and who had died on the boat in Broome (Geoff died on board in Bowen). It was a lovely story which all our family and friends treasured, even the avowed unbelievers. Cornelius was sold again and to my delight I next heard she was back in Broome taking tourists on moonlight cruises. By that time she was the only lugger left. She featured in many advertisements and websites about Broome – “a traditional pearling lugger” – with tan sails, stern seating and safety rails? Over the nest few years I received occasional reports from friends or their friends who had seen or sailed on her. Then one evening I received a phone call from Perth, the same Carole who had frogmarched me on board at Southport (how had she known) with the news that Cornelius had dragged her anchor in a storm, bounced along Cable Beach and been wrecked. Perhaps it was meant to be – the ghost was set free at last. Great story, Nancy. It must have been an exciting and, at times, hairy life sailing around Australia. This story was a great read. My partner and I were in Broome 1997-1998 and he worked on the Cornelius doing the tourist sunset cruises. I also worked on her on the odd occasion the hostess couldn’t work. It was a sad day in June 1998 when she was wrecked on Cable beach by an un-seasonal storm that broke her from her mooring. We left Broome not long after. Thank you. It’s always great to hear from people who knew the boat, even if she was by then in a radically altered state to the way I knew her (no guard rails just low bulwarks, interior layout completely different etc). I still wonder what happened to the sails, would you know? I do know some of the salvaged timber was used to make a bedhead and probably other objects. Once in a while I type words like “Cornelius”, “Lugger”, “Perling” into “Google” or similar… just to see what happens. And I have done this for 25 years now, or at least since internet exists. And then I found this…Wonderfull! I was working on her in Southport in 1989, for about a year before I sailed over to Europe. I only have fantastic memories of that time on board in Mariners Cove, she was a fantastic ship and we had a great time taking tourists out to sail. Well, and fixing things here and there. But like any brilliant time its the people that count and thats what made my time on Cornelius unique. Thanks for haven written this story, this story I did not now so far. Thank you Mike, it is lovely to know Cornelius is remembered so fondly by so many people. I hope to add lots more photos later on when I can access them. I have just enjoyed reading your lovely story about sailing and life on the Cornelius – I have lived in Broome for many wonderful years – I remember the lugger a little. I was googling pearl luggers as I am writing and illustrating a children’s book with them in it, to be published this year in Broome. Please do let me know when the book is published, I’d love to purchase a copy. Do you need any photos? Actually the only ones I have at the moment are in the Blog but I have hundreds in storage. I’ll be able to access them – finally! – in June. I was overcome with emotion on reading of Cornelious..
We also have a former Broome Pearling Lugger.. Centurion…B8..B10..B20…built 1955. We love her dearly as did you and your husband..
Have just travelled from Airlie.. and am now anchored in Morning Bay Pittwater. Can send you some photos if you would like. Lovely story and great memories..
Hi Rodney and Caroline, I can hardly believe there is still one semi-original lugger left. Yours would have a little wheelhouse I think? We were the last lot without one, and steering was by by block and tackle on the very heavy rudder. We were on Pittwater for years, particularly in 1974 when we first got back to Sydney from Broome and started work on the boat. We often visited in later years too. One of my favourite places. I would love to see some photos of Centurion, and to learn more about your travels with her. 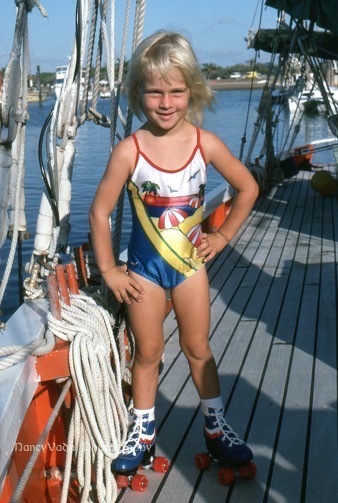 I remember the name – I’m fairly certain I saw the boat in Sydney in the 1980s but nobody was on board at the time. i’ve just been doing some Googling and notice with astonishment that she went across the Bight in 1980 – SAME YEAR as us when we encountered NE winds for a time – reported to the weather bureau to great astonishment all round! Would you please email me at ciotach72@gmail.com. 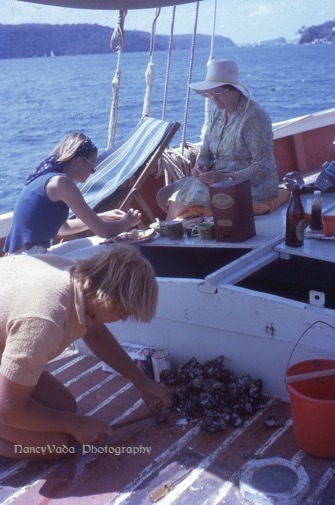 Hi Nancy, I was talking to girls at work about how I used to host guests on a pearling lugger in Broome named Cornelius many years ago and decided to google her when I found your story which was wonderful to read. I wish I had known your story then as I spent hours serving drinks and nibbles to tourists in Broome on the Cornelius. I was only on her a few weeks before she went down in Broome we visited her remains on the beach the morning after the storm. My husband (formally a pearling diver) and I had a tear or two that morning. Amazing how one boat has touched so many people. I think a movie should be made about the Cornelius. Hi Melissa, thank you so much for your beautiful words. I have been meaning for years to get all my slides in order (you can imagine how many), scanned etc and to write a book … this just gives me more impetus still. Cornelius actually was in a movie/TV series, heavily disguised and painted white, pretending to be the “Krait” . It was after we had sold her so I don’t know all the details. Not “The Highest Honour” but an earlier production. Please do Nancy I would love to read your adventures and more of the story of the Cornelius and I’m sure I’m not alone. Look forward to reading it one day.